Do you want to attract more customers to your brand? You can create an attractive campaign over these 20 to 23.99 square inch custom die cut magnets - outdoor & car magnets 30 MIL. 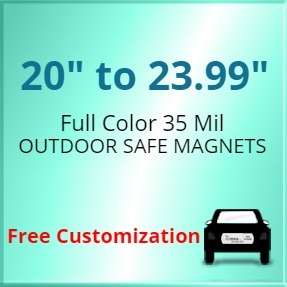 We offer complimentary CMYK printing over these outdoor safe promotional magnets. These die cut magnets will make your brand information visible and accessible to your customers. You can indulge these 30 MIL magnets for brand promotions while driving from office to home or vice-versa. Order yours today! Request a quote to know what price savings you can expect on bulk ordering 20 to 23.99 square inch promotional die cut magnets - outdoor & car magnets 30 MIL. Product Weight: 11 lbs per 150-approx.